Here’s some information to help you get up and running with Fastvue TMG Reporter. If you have any issues, please don’t hesitate to get in touch. Download and run the TMG Reporter installation on a dedicated server or VM (see recommended OS and Hardware Requirements below). Do NOT install Fastvue TMG Reporter on your TMG Server. 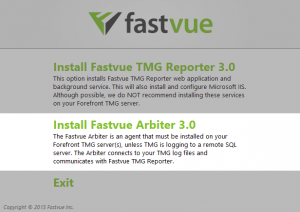 Install the Fastvue Arbiter on your TMG Server. Only do this step if Forefront TMG is logging to SQL Express (default) or W3C Text. Do not install the Fastvue Arbiter if Forefront TMG is logging to a remote SQL server. Native *.iis text logs are not supported. The Fastvue Arbiter connects to TMG’s local logs and sends the data securely to the Fastvue TMG Reporter server on port 49361. 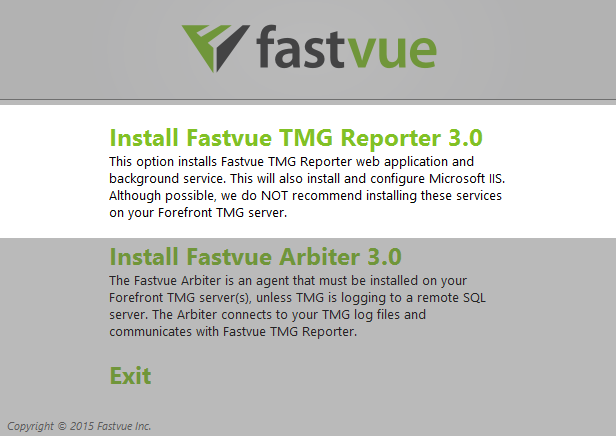 If you installed the Fastvue Arbiter, create an Access Rule on the TMG server to allow communication between the Fastvue Arbiter and TMG Reporter. Allow TCP 49361 Outbound from the TMG Reporter server to Localhost for All Users. Click here for detailed instructions on adding the Fastvue Arbiter Access Rule, or jump to the 04:00 mark in the video above. In your web browser (IE8 is not supported), browse to the TMG Reporter site you installed in step 1 (e.g.http://10.1.1.1/tmgreporter), and Add your TMG Server as a Source. You can do this on the Start page, or in Settings | Sources. If logging to a remote SQL Database, use the ‘SQL Server’ option in Settings | Sources. Windows Server 2008 R2 or above (will also run on Windows 7, Windows 8 or above , but a 64 bit server OS is preferred). Also see Fastvue TMG Reporter’s System Requirements Explained. 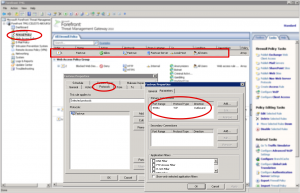 * Do not install Fastvue TMG Reporter on your Forefront TMG Server. TMG Reporter installs IIS (a web server) as well as a resource intensive service. This can affect the performance of your server, and increase the attack surface of your firewall. TMG Reporter imports your Forefront TMG’s log data into it’s own database. As a general rule, the size of this database is roughly 25% of Forefront TMG’s original SQL Express log data. You can set the data retention policy in Settings | Data Storage (see screenshot). The default is 90 days or 50 GB, whichever comes first. 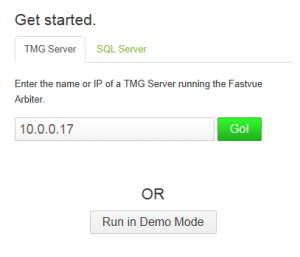 Can I run Fastvue TMG Reporter on the Forefront TMG server? Although it is technically possible to run TMG Reporter on the TMG server, we do not recommend it especially in a production environment. Forefront TMG is a firewall, and it is not good practice to install other services and application as it increases the number of possible attack vectors. There can also be issues with port conflicts when running IIS on your TMG server as other applications and services such as Web Proxy Auto Discovery may also try to use port 80. Fastvue TMG Reporter is also a resource intensive service (by design) and if you run it on your Forefront TMG server, it may impact the performance of your Firewall and Proxy. What is the Fastvue Arbiter? The Fastvue Arbiter is an agent that runs on the TMG server. It’s purpose is to access your logs and communicate with the Fastvue TMG Reporter server. At the moment it only works with TMG’s default SQL Express logs and W3C text logs (not TMG’s IIS logs, or separate SQL database). The Arbiter and Dashboard communicate on a specific port (49361) which you can add an explicit access rule for in TMG. We developed the system this way to maintain the security integrity of your Forefront TMG server. The alternative is to either open file shares, or enable network access to TMG’s SQL Express database. Both of these options increase the attack surface of the Forefront TMG firewall. In consultation with TMG experts (such as Richard Hicks – tmgblog.richardhicks.com), we decided the best option is to create a small footprint agent to run on the Forefront TMG server that securely communicates with the Fastvue TMG Reporter server. How does Fastvue TMG Reporter work? Fastvue TMG Reporter consists of both a website (runs on Microsoft’s IIS Web Server) as well as a Windows service that runs constantly in the background importing and analyzing your Forefront TMG log files. When you install TMG Reporter, a web server (Microsoft IIS) will also be installed and configured. You can then browse to the website you specify during installation to monitor your network statistics and view alerts. What does the ‘Anonymous’ user mean? How do I secure the Fastvue TMG Reporter website? If Forefront TMG’s URL Filtering is not enabled, all productivity sections in TMG Reporter will be blank. It is quite common for URL Filtering to become disabled after the 90 day trial of Forefront TMG, unless you enter a license key into URL Filtering subscription. To enable URL Filtering, see our article Productivity Sections are Blank. It has been reported that in some cases, the Fastvue TMG Reporter installation finishes prematurely and no website or virtual directory is created, and no files are installed. This is due to some pre-requisites in IIS not installing properly. To fix this issue, please see our article TMG Reporter does not install. Something is not working, what should I do? Visit our Support Portal. Here you can search our knowledge base, post a question, send us an email or engage us in a live chat.